If there’s one thing I lament about the UK anime industry, it’s the size of the audience. It’s just about large enough to support the mainstream releases, and the occasional niche title, but few distributors have the ability to take a chance on something odd, something out of the ordinary. As I type this, I’ve just finished watching the first season of The Asterisk War, a show where an unlikely teen male transfers into a large academy where students do battle with magical/technological/giant robot powers, a story adapted from a light novel. I think at this time, there are some ten identikit anime available in the UK fitting the same template. A comedy about the office bureaucracy in Hell? You won’t find one of those with a BBFC rating. I’ve vacillated about Hozuki’s Coolheadedness for quite a while now, but a sale at Madman Entertainment over the New Year has given me a chance to try before I buy. Really, when they are clearing out DVDs at AU$ 5 a pop, you may as well be streaming the show on Crunchyroll. If I like it, I’ll start putting some money aside for the Sentai release, as the Madman discs have more than a few issues. And Sentai have the second season as well. If you’re Enma, the King of Hell, passing judgment on all of the dead that come before you, you don’t have a lot of time for the hard work of managing the underworld; especially when Hell is divided into 16 divisions, and 272 subdivisions. That’s a lot of hells, and that’s just Japanese hell on top of that. 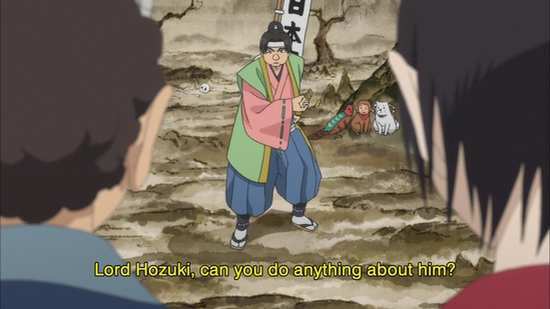 Fortunately Enma’s acerbic right-hand-man Hozuki has a handle on things. He’ll keep hell ticking over even if he has to bend a few rules to do so. 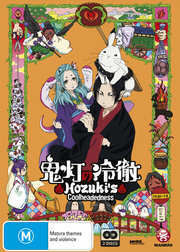 13 episodes of Hozuki’s Coolheadedness Season 1 are presented across 2 DVDs from Madman Entertainment. Hozuki’s Coolheadedness gets a 1.78:1 anamorphic NTSC transfer on these discs. Just as with some recent shows such as The Asterisk War and Girlish Number, Madman Entertainment have created this transfer from scratch for the Australian market, and they’ve done so by taking Sentai Filmworks’ Blu-ray discs, ripping the episodes from them and scaling the image down. That means that the burnt in subtitles are of Sentai’s Blu-ray style and font, and once again, there is the sense that detail and richness of colour has been lost in the process. Certainly, while it’s watchable enough, it doesn’t reach the clarity that you might expect from a DVD release. 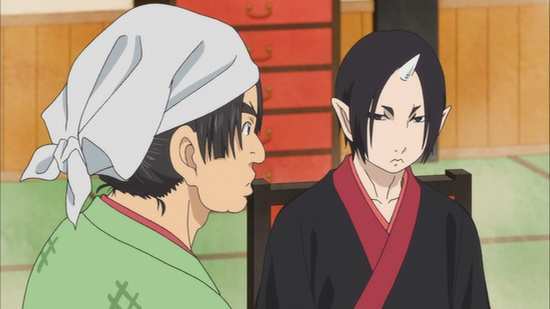 What’s surprising is that there is a DVD master for Hozuki’s Coolheadedness. Sentai Filmworks released the show on 3 discs in the US, and it begs the question as to why Madman didn’t simply use those. 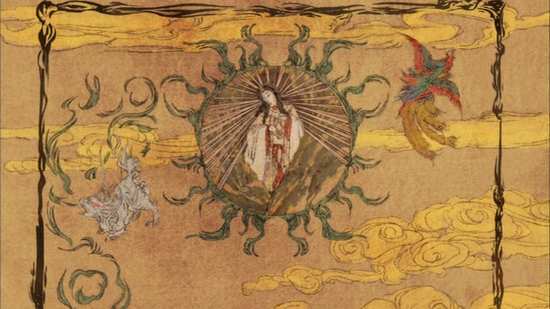 The show itself is a quirky one, with off-beat character designs, while the various otherworlds of hell get artistic representations. It’s certainly very interesting to take in as an aesthetic. You get DD 2.0 Stereo Japanese with translated English subtitles burnt into the print. As mentioned, they are in the Sentai yellow font from their Blu-ray discs. 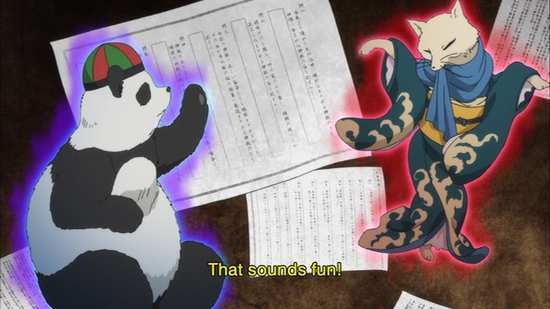 The dialogue is clear throughout, the subtitles accurately timed, although there is the odd questionable translation, tanuki written as ‘badger’ in the subtitles. There are also a whole heap of translation notes and you’ll be kept busy with the pause button to keep track of them all. The audio is fine in a dialogue heavy show, while the odd moment of action and sound design comes across well. The discs present their content with Madman’s generic static menus, although you do get one translated English credit reel at the end of each disc. Disc 2 has the extra features, one textless opening, one textless closing, and trailers for Sword Art Online Season 2 Part 1, Pet Girl of Sakurasou, Nisekoi False Love Part 2, Magi: Kingdom of Magic Part 1, and Love, Chunibyou and Other Delusions. I won’t be getting an upgrade for this show, and it’s not because Madman’s DVDs magically turned out to be good enough. Hozuki’s Coolheadedness is an acquired taste, and one that I failed to acquire with this first watch through. You need a lot of patience to get this show, and that’s something I was lacking. 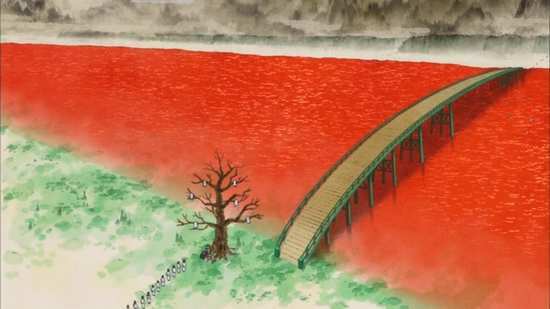 It is after all a show about the Japanese version of the afterlife, of hell and heaven, and as the intro indicated, with 272 subdivisions, it’s a complicated place. There are a whole host of demons and monsters, all with their own back-story and mythology, and with the show’s sense of humour, there are a load of pop-culture references as well. All that means translation notes. This is a show with a whole lot of screen captions explaining jokes, explaining the mythology behind a certain character, and I wound up with two choices. One was pressing pause for every caption to read it and understand the joke, but by doing so breaking up the momentum of the show and the rhythm of the humour. The other was ignoring the caption, and just taking in the show as is, but missing half of the jokes in the process. It boiled down to time. 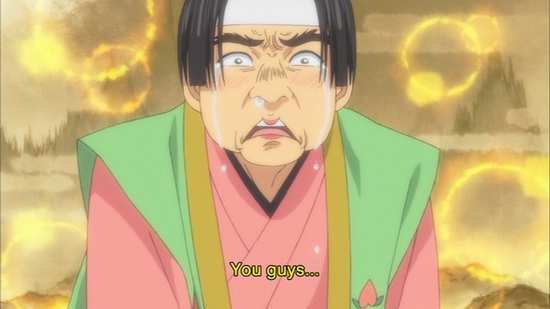 I don’t have six hours to watch a three hour show, so I wound up not finding Hozuki’s Coolheadedness as funny as other, more patient anime fans have. It’s a sitcom, if the situation is Hell, and the cast are a bunch of demons, the Great King of Hell Enma and his assorted minions. It’s Enma’s job to sit in judgment over the recently deceased, and to cast sinners into the specific hell they deserve, with a suitably cruel punishment devised. 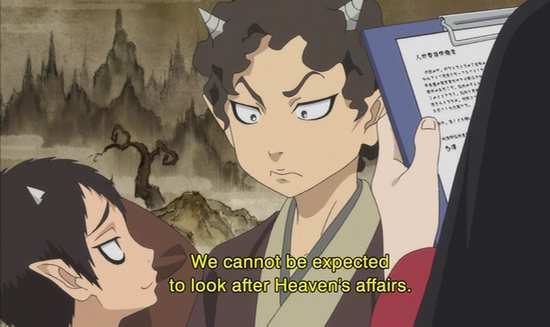 Despite all this, Enma’s an easygoing chap who would much rather boast about his cute grandson, so a whole lot of the day to day administration of hell falls on the horns of Enma’s right hand demon, Hozuki. The show follows Hozuki on his job, the various demons that he encounters, and the never ending bureaucracy of the afterlife. The first episode will be a litmus test as to how you see this show. Each episode is split into two stories, and in the first half of the first, Hell gets some new residents when Momotaro shows up. Most anime fans will have heard of Momotaro, the boy who was born from a peach, as he’s a myth that gets referenced a lot in anime. 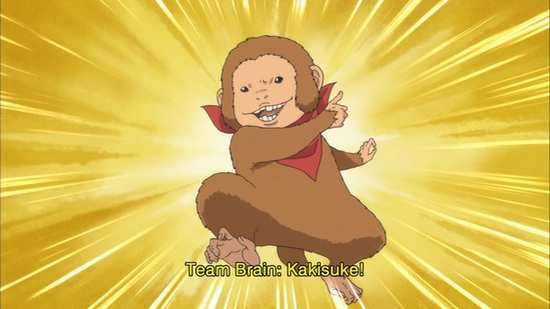 But you probably won’t have heard of his anthropomorphic friends, a dog, a monkey and a rooster, who in this show are just as important characters as Momotaro himself. You’ll have a whole lot of reading of translation notes to keep in touch. 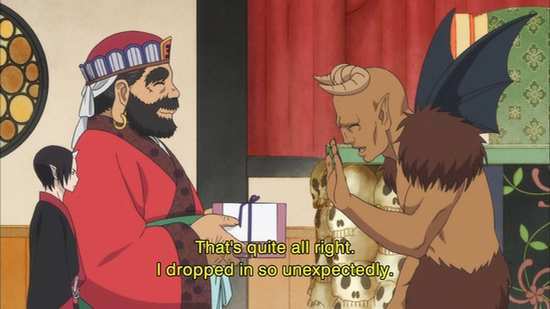 Something a little easier to comprehend happens in the next episode, when Satan shows up in Japanese Hell as part of a cross-cultural exchange, with an eye on taking over, only to be floored when Hozuki gives him the grand tour. Subsequent episodes see more Western archetypes of the afterlife paying a visit to the show, characters like Beelzebub (with a bee motif in his character design), and Lilith. 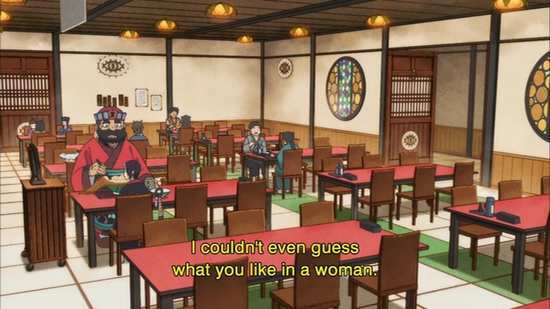 But generally the characters in the show are from Japanese and Chinese mythology, such as Hozuki’s archrival Hakutaku, a big presence in Shangri-La, the antithesis of the straight laced and acerbic Hozuki, a demon who loves drinking and womanising. 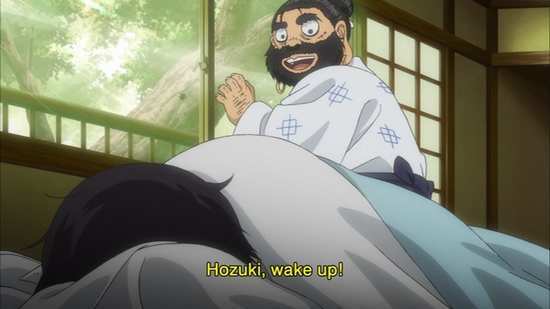 The humour in Hozuki’s Coolheadedness comes from the juxtaposition of hell and the world of the living, with the denizens of the underworld sharing much the same concerns as mortals. Japanese Hell and Western Hell are like two rival companies, the demons and minions treat their jobs like a nine-to-five, when torment starts slacking, Hozuki organises a training course. There is a pop idol in hell, and a gossip rag with an unscrupulous reporter who meets his match in Hozuki. The humour in Hozuki’s Coolheadedness relies on a lot of references, to pop culture and mythology which you have to put the time, and the pause button in to appreciate. 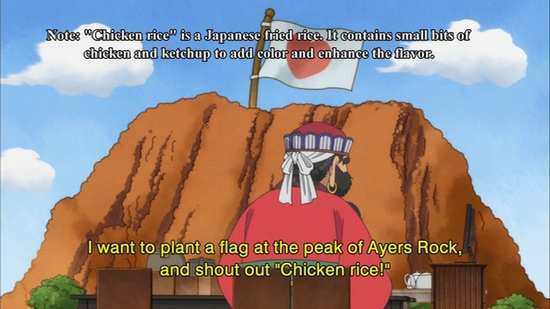 It has the usual sense of wordplay to the humour which is uniquely Japanese, and is usually lost in translation (good subtitles and translation can compensate for that), and it also relies on the humour of character archetypes. Only one of those aspects really worked for me. If I had the time to read all those translation notes, I might have developed more of an appreciation for the show, but sometimes you just want to laugh without having to take a correspondence course. I did laugh out loud at Hozuki’s Coolheadedness, but that was only a couple of times over the 13 episodes, and that’s not enough.